New data from the United States Mint provides the opening round of sales stats for the 2013 America the Beautiful Quarters Proof Set. Released on Jan. 22, 2013, the annual proof set is the fourth issued since the America the Beautiful Quarters series launched in 2010. Debut sales totaled 48,901 units through to Jan. 28, 2013. 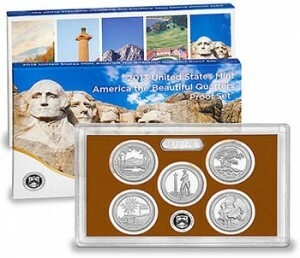 It represents a relatively modest easing of 1,843 units from the opening performance of last year’s 2012 America the Beautiful Quarters Proof Set. This older set remains on sale with collectors most recently buying 670 more to lift its total to 138,289. Early demand for a newly released U.S. Mint product is an indicator of interest but it does not necessarily drive a product’s success. The following table list debut and current sales figures for every America the Beautiful Quarters Proof Set issued. This table provides a list of the America the Beautiful Quarters released since 2010. Order 2012 – 2013 America the Beautiful Quarters Proof Sets from the U.S. Mint produce page located here, or call the toll-free number of 1-800-USA-MINT (872-6468).